I feel like I haven’t chatted with you all in a while! 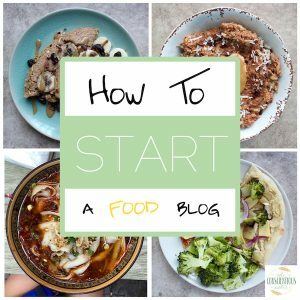 The last couple weeks have been a bit of a whirlwind–hence the dip in recipe posts–but all is good and I’m still whipping up some amazing (if I do say so myself) recipes. 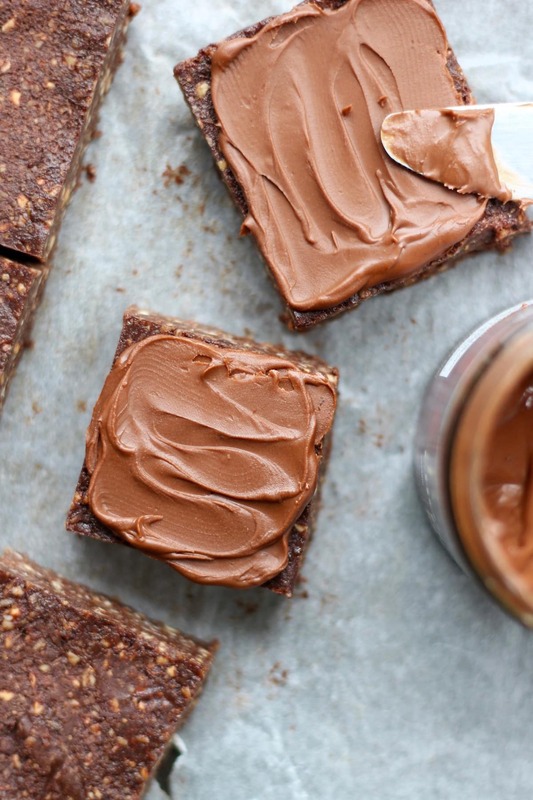 These no-bake Nutella Brownies are definitely one of those recipes, but we’ll get to them in a few minutes. So…long long long story short, we’re moving! I’ll fill you all in on the details if and when I can, but for now we’re currently visiting my parents in Ireland (!!!!!). It’s always a dream to be here in this beautiful, green, currently-dreary country. This is my third time to Ireland and I always feel so joyful and at home here, no matter what the weather is like. Speaking of weather, it has been quite rainy since we arrived. Thankfully there is usually a break in the rain most days when we can get out of doors and enjoy the fresh, crisp air. Also, Irish people are so incredible kind. I feel like everyone I’ve talked to is friendly, welcoming and genuine. While I do miss my open, Chinese markets, I definitely can’t complain about the amount of vegan goodies available at the grocery stores here. My parents live in walking distance from an Aldi and just a short drive from a Tesco. 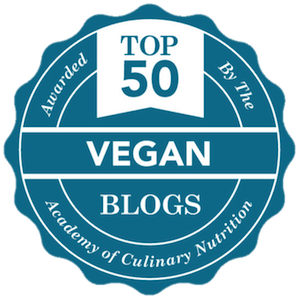 Both of these grocery stores have so many amazing, whole-food, vegan products to choose from. I could literally spend hours strolling through the aisles! Aldi has labels on their packaged foods now, letting you know if things are vegetarian or vegan and their prices really can’t be beat. Tesco has so many fully vegan food ranges it’s hard to choose what kind of vegan cheese, butter, milk, yogurt, snacks, ice cream, tofus, veggie burgers, chocolate, etc. I want to try next. I’ll definitely be working my way through as many vegan items as I can while we’re here! The chilly weather really has me craving cozy, comforting food as well. My mom has been whipping up some amazing veggie soups and I drink hot Earl Grey tea with almond milk all day long. In keeping with Irish culture, I love having a sweet treat with my morning or afternoon tea as well, so I’ve been busy in the kitchen lately testing all kinds of goodies! 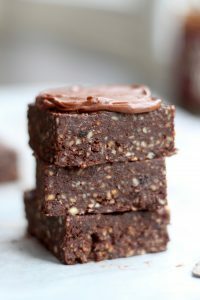 These 4 ingredient Nutella Brownies were inspired by a jar of Chocolate Hazelnut Butter that I kindly received from Jem Organics. I really am obsessed with their indulgent nut butters. They are rich, yet full of healthy, good-for-you-ingredients. They are a bit on the pricey side, but once you have a taste, you’ll agree with me that they are worth every penny! Their Cinnamon Maca Almond Butter is probably my favorite and I use it as frosting on top of baked goods. Yum! 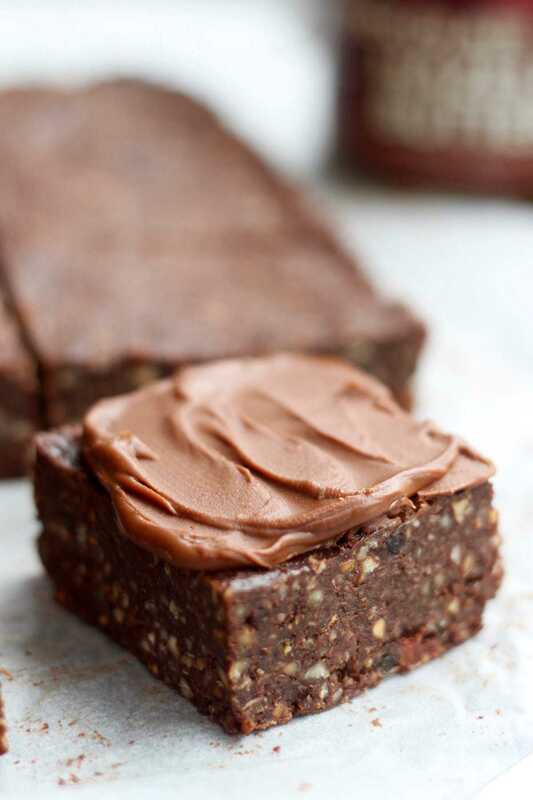 Anyways, chocolate hazelnut butter isn’t necessary for these no bake Nutella brownies, but it really does take them up a notch when you use it as frosting. 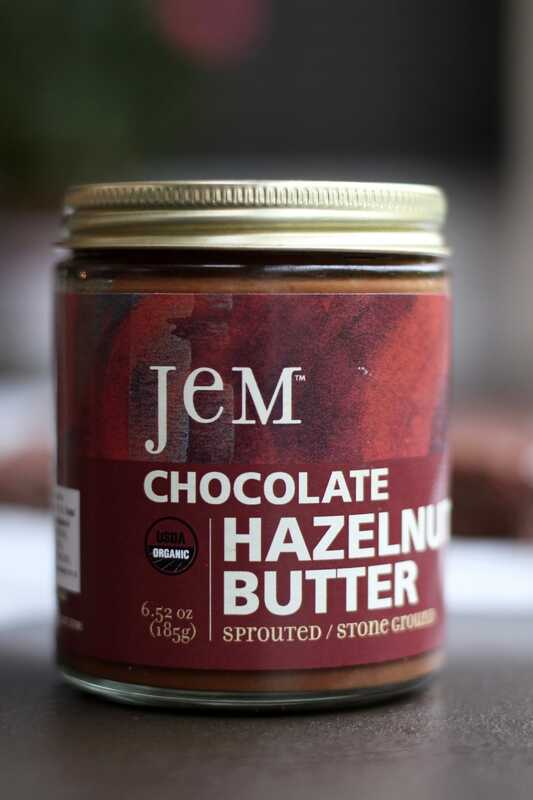 If you want to frost these brownies, but can’t get your hands on some of Jem Organics Chocolate Hazelnut Butter, I know there are a bunch of other dairy-free brands of chocolate hazelnut spread out there! 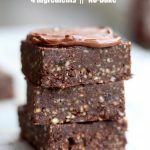 I have quite a few no-bake brownies and energy bite recipes on the blog, so be sure to check them out after you give these Nutella Brownies a try! 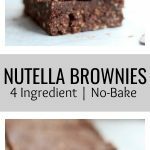 If you give these easy Nutella Brownies a try, please let me know! Leave a comment down below, rate the recipe and be sure to share it with others! Preheat your oven to 325℉. Line a 8x6 or 8x8 baking pan with parchment paper. Set aside. Spread the 2 cups of hazelnuts onto a baking tray. Bake the hazelnuts for 8-14 mins, shaking half way through, until roasted and fragrant. Be sure to watch them carefully towards the end so that they don't burn! While the hazelnuts are roasting, make sure all of your dates are pitted. If they are not gooey Medjool dates, soak the dates in hot water for a few minutes until soft. Then drain them and remove any excess liquid. After the hazelnuts have been roasted, rub them inside of a tea towel to remove some of the loose skin. Place the roasted hazelnuts into a food processor and process until a coarse flour forms. Add in the cocoa powder and sea salt and pulse a few time until combined. Lastly, add in the gooey or soaked dates and process until a uniform, sticky dough forms. You may need to stir and scrap down the batter from the sides of the bowl a few times during this process. Pour the batter into your lined baking pan and press the batter down until evenly flat. 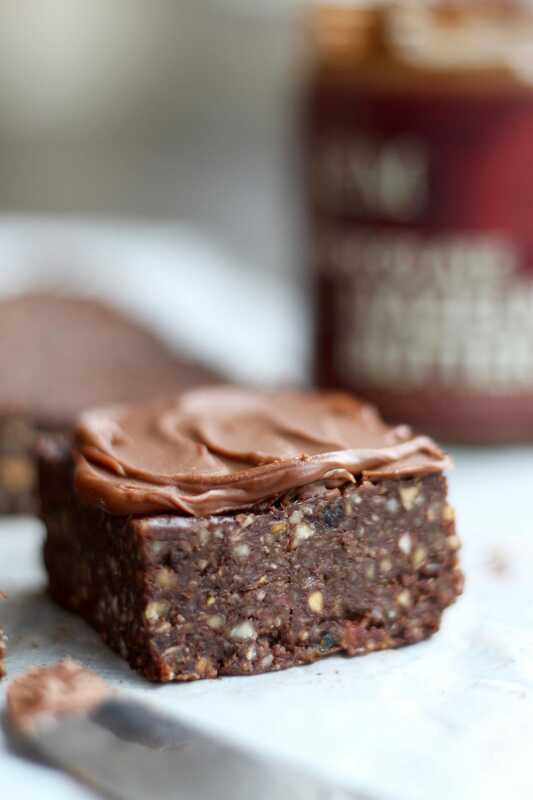 You really can make these brownies however thick you like by either using the entire baking tray, or by leaving some empty space in the pan for thicker brownies. Place the brownies in the fridge or freezer to set. When ready to eat, remove the brownies from the freezer and use the parchment paper to lift them out of the pan. If desired, "frost" them with some Chocolate Hazelnut Spread. Cut them into squares and enjoy! Depending on the stickiness of the dates used, store these in the fridge or freezer. Remove them a few minutes before serving to soften.